Mars Primary Deity – Male or Female? Fig. 1 An artistic rendition of the Bull of Heaven based on Senmut’s tomb. Fig. 2 Senmut’s tomb depicts the column of smoke and fire with a bull form at the top. The deccan circles are somehow related to the circum polar stars, volcanoes in the northern hemisphere of mars. Cyclic Catastrophism, based on ancient texts, reveals that Mars became captured in a geostationary orbit of the Earth and released into a orbit which crossed that of the Earth. This cycle was repeated one hundred times between 3687 and 687 BC. As a result, all of the resources of the previously living planet Mars were transferred to the Earth, terraforming it. This process, which was completed in 687 BC resulted in the world and the solar system we know today. When Mars orbited the Earth, it appeared ~600 times the area of the full Moon. The transfers were the result of convulsions within Mars caused when the Moon, or the Sun and Moon combined, passed through alignments (behind) with it. 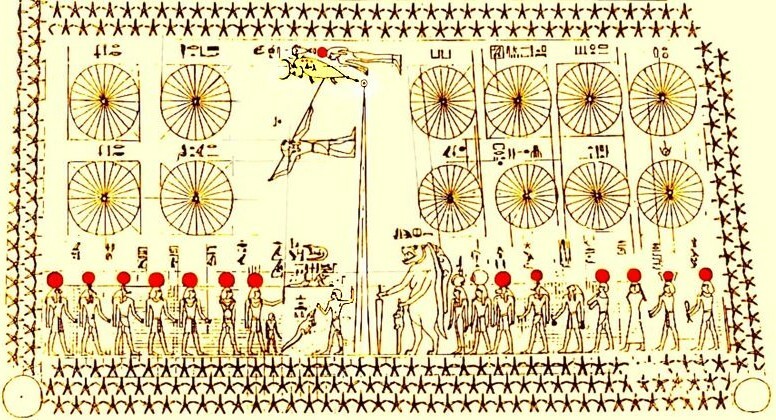 When Mars orbited the Earth, its northpole remained oriented toward the Earth, appearing like a giant wheel slowly revolving and the many features (deities) on its surface were known by name by people in every culture in the world. It was like the TV for the whole world, but there was only one channel. The primary male deity was named Prajapati, Purusha, Brahma, Osiris, Zeus, Saturn, EA, Atlas, Shu, Anu, Thor, Nimrod and the Heavenly August Pillar. No feature like this has been seen in the last 2,700 years. During Cyclic Catastrophism it was the most dynamic and spectacular feature on Mars, which arose in the first year of each 14.4-year geostationary encounter with the Earth. It is best described by the sum of its epithets in all cultures. Surprisingly, the Bible describes it best, as ‘the column of smoke and fire’. The most descriptive texts are the Rg Veda and Purusha Suktam, Egyptian pictographs and modern-day NASA photographs of Mars’ northern hemisphere pole corroborate them. Figure 1 is a NASA mosaic of Mars’ north pole area, which I have modified to remove the snow and added a feature resembling the primary deity, a vertical lava column over 2000 km high with flames at the top. 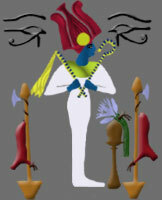 Figure 2 is a drawing of one panel of the ceiling of Senmut’s (Pharaoh Hatsepus’ architect) tomb, with the primary deity, the column of smoke and fire extending high in the center. The horns which led to its description as a the Bull of heaven, were probably formed by flames issuing from the top of the column, but the phallic shape may have been a factor. I have used it in an attempt to similate its appearance. The twelve circles are meant to show the positions of the circumpolar ‘stars’ at different dates or times of the day. These were actually volcanoes on the surface of the wheeling Mars, described in epithets for the Egyptian deity Apt, called ‘the mother of movement in a circle’, ‘the mother of the starry revolutions or cycles of time’. Unfortunately the image is not clear enough to see the individual ‘stars’. The Hippopotomus represents the island at the north pole of Mars, ‘the risen land’. The staff in his right hand points to the exact center of rotation of the planet as seen from the earth, which wobbled due to the Tharsis Bulge on the equator or rim (felly) of the wheeling planet. column, was relatively fragile, supported primarily by the tidal attraction of the earth, attaining a height above Mars’ north pole greater than 2,000 km. For comparison, the planet itself was about 33,500 km above the surface of the Earth. This structure could only form in the unique low gravity corridor between two terrestrial planets in geostationary orbits. A commonly misinterpreted description of Purusha in the Purusha Suktam of the Rg Veda, actually describes the column in terms of a standing man-like figure, whose head was the skin color of the Brahman, whose chest was the color of the Kshattria, whose loins were the color of the Viasas and whose feet the color of the Sudras. This has been studied for several hundred years, with the mistaken idea that it described the origin of the Indian castes. The most significant physical and religious aspects of this feature were brought about by alignments of Mars with the Moon, or the Sun and Moon combined. They caused great convulsions in the interior of Mars, resulting in rapid-fire sequences of hot rocks as large as 20 km being blasted at high speeds into space, many of which came through the same volcanic vent from which the Purusha column was continually fed lava throughout each 14 .4 year encounter. These convulsions and the massive ejected hot rocks caused the hardened lava tubes supporting the column to collapse temporarily. This led to the impression that Prajapati (Purusha) or Brahma (Hindu name) sacrificed himself in order to create new ’embodied spirits’ -those glowing bodies that shot into space. So many bodies were ejected through this feature that the Purusha Suktam states: Three quarters of Purusha went upward, one quarter of him remained here. From this he spread in all directions into what eats and what does not eat. The mass of material lost by Mars during Cyclic Catastrophism is quite evident in the topography of Mars today. The entire northern third of the planet is seven kilometers below the planetary datum, as shown in the Dog-Faced Star post. The famous Egyptologist Gerald Massey translated a passage in the ancient Egyptian Pyramid Texts, which gives a much more physical description of the male and female aspects of the column. He did an excellent job, but the resulting translation has remained a mystery to Egyptologists until now because no one in the modern world understands that the text described unique features on another planet. His translation described the north pole of the ‘world’ extending up into space as a ‘celestial pole’ (much more definitive than the earth has today), but the south pole was described as a sub-terrestrial pole immediately beneath the north pole pointing down into the ‘earth’ below. Because the north pole of Mars remained facing the Earth for each 14.4-year geostationary orbit, people on the Earth never saw its south pole. So the lava vent going down into Mars, from which the column arose, was considered the south pole. It was also considered an entrance to the Amenta, the underworld, as explained below. The convulsions within Mars resulted in the ejections of hot glowing bodies from deep in Mars through the lava colum feature, resulting in its collapse. but after the convulsions ceased the lava normally resumed its upward trajectory, the tubes again hardened and the great column reformed. This was described very clearly in the Rg Veda, which states that the process resembled ‘a serpent shedding its skin’. The oldest name for the hardened lava column was Prajapati and its collapses were called ‘sacrifices’, imagined by the Vedic people to produce ’embodied spirits’, the hot, glowing bodies that were ejected through his body. 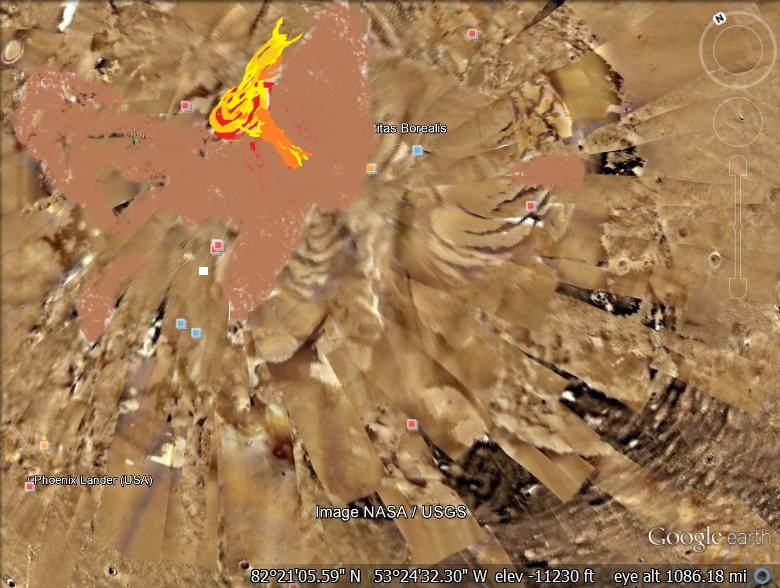 Although the flaming hardened lava column deity was a spectacular, male deity, its temporary collapses revealed the huge volcanic vent which resulted from years of massive upward flow from deeper and deeper in the interior of Mars. What was described by Massey as the sub-terrestrial south pole, was seen as the female counterpart of the column male member in many cultures. In Hindu myth the collapses were described as the male ‘lingus’ suddenly becoming or revealing the female ‘yoni’. It is a mystical, perhaps poetic circumstance that this vent, the female aspect of the hardened lava column, was the single, most critical feature required for the terraforming of the entire Earth. One hundred 30-year cycles of capture and release of Mars were required in for this reformation. One reason was that only half of the water, that in the northern hemisphere, was potentially available for transfer to the Earth during each capture so each release period allowed the remaining water to be redistributed. The releases were also required for the planet to recover from the many convulsions, in order that the process could continue. The releases occurred at the vernal equinox of the fourteenth year of each encounter, because that was when proto-Venus, then in an interior orbit, approached closest to the Earth-Mars pair. At those times the combined gravitational force of the Moon, proto-Venus and the Sun, all aligned, caused the greatest internal convulsions of Mars, and large bodies were ejected through the vent at the north pole. The same gravitational forces combined to raise the level of the northern ocean so that it flowed over the northern island and into the enlarged vent deep into the outer core. This cascade flashed to steam, forcing the solid iron core of the planet to protrude through the great rift called the Valles Marineris on the equator of Mars. The Egyptians called this the ‘Eye of Horus’, but the Egyptian legend then states the eye came out into space as the deity Hathor (Hermes, Mercury), confirming that the solid core left Mars. As soon as this happened the outer shell of Mars began to drift away from the Earth to the west, while the solid core zoomed around the Earth to the east in what NASA calls a ‘slingshot maneuver’ and caught up to the outer shell in eight days, reentering through the same gash allowing Mars to reform during the next 15.6 years in which it orbited the Sun. The central portion of the northern island which formed during its last encounter with the Earth can now be seen on Mars. It is the plateau at the north pole, 3 km above the surrounding terrain, which amazingly has a (now frozen) whirlpool on its top. Because of the proximity of the Aryans to Mt. Kailas, above which Mars orbited. The volcanic eruptions, clouds, lightning and the great falls of meteorites assoocited with the release of Mars, kept most Aryan people from seeing this actual astronomical event. As a result there is little mention of the deity associated with Mercury, Sarama who, because she always returned when Indra (Mars) sent her on an errand, was referred to as ‘Indra’s dog’. In the Rg Veda, the oldest name for the column was Prajapati but he had dual aspects. The male aspect was called Purusha, the column of smoke and fire, and the female aspect Viraj, which was the vent from which Purusha rose. Thus the world egg first appeared in the northern ocean, and eventually rose above the water, and the lava column from the island. This results in an apparent contradiction in Rg Veda 10.90.5 “From him (Purusha) Viraj was born; again Purusa from Viraj was born”. No Vedic scholar understands this. For the Aryans, the center of the ‘world’, or the mandala (the disc of Mars) is the focus. Therefore Viraj is also variously referred to as ‘the navel of the universe’, ‘the navel of the Earth’, and ‘the navel of the sacrifice’. The vent is also described in Hindu myth as the navel of Vishnu from which Brahma grew in the form of a lotus, where the northern island is imagined as the belly of Vishnu. The rocks blasted from deep in Mars’ interior through hundreds of volcanoes deposited many precious elements near the surface of the Earth normally expected to be deep in the its interior. such as iron and the heavier elements and the rare earths, without which we would still be in caves. Planetary scientists have relatively recently began to puzzle over this mystery, but the one real God has understood all the needs of this modern world since the beginning of time. ~ by Angiras on March 7, 2014.